Harbor Moon is a graphic novel that follows Timothy Vance, a soldier that receives information from someone claiming to be his long-lost father. So he takes a trip to the small town of Harbor Moon, Maine. It turns out that the man he is looking for hasn’t been there in thirty years. After some digging for truth, Tim finds himself in grave danger, he also finds that Harbor Moon is harboring a hell of a secret. Everyone in town is a werewolf and the man he was looking for may be just like them. Just as a ruthless band of werewolf hunters descend upon the town, Tim must decide whether he is going to stay and fight or turn his back on what he really is. Ryan was awesome enough to send me a copy of this amazing graphic novel, and yes it’s exactly that – amazing. The story is one that any horror and action fan will love, it has just the right amount of mystery and intrigue mixed with plenty of blood and gore to keep your attention. Lets just say that the werewolves on these pages are nothing like the pansy wolves in Twilight – these guys are badass. As for the artwork, it is absolutely phenomenal. It took me much longer to read this graphic novel than any others due to the fact that I was so distracted by how beautiful the artwork was. I would read everything on one page and before I would turn to the next one I would stop and take a good hard look at each scene again. I’m very impressed with the artists of Harbor Moon – well done guys. 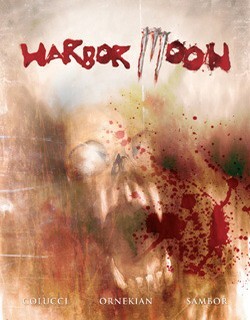 I highly suggest picking up a copy of Harbor Moon. You can buy it at their official website.